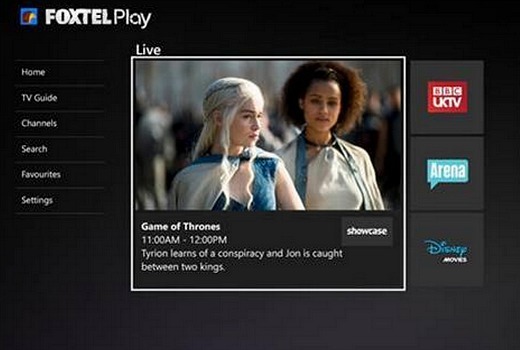 Foxtel Play added to Xbox One, Sony smart TVs. Foxtel Play has now been added to Xbox One games consoles and Sony smart TVs. From today, Xbox One owners can download the Foxtel Play app to their console from the Xbox marketplace. “Xbox is always striving to ensure our Australian users have the best entertainment experience, so we’re thrilled to be bringing the Foxtel Play app to Xbox One. We have had a long association with Foxtel Play on Xbox 360, now Xbox One users can enjoy both watching and playing Game of Thrones at the same time, ensuring that they have the very best experience with the content they love,” said Jeremy Hinton, Business Lead at Xbox Australia. Meanwhile Sony smart TV owners with a 2014 model can now download the Foxtel Play app from the Sony Entertainment Network. Foxtel Play enables customers with a broadband connection to stream and watch programs via eligible Sony, Samsung and LG Smart TVs, Xbox One, Xbox 360, PlayStation 3 & 4, selected Samsung Blu-Ray and home theatre systems and PC and Mac computers. Foxtel Play customers can also access content on selected smart phones and tablets by downloading the Foxtel Go app.